I recently learned of The Plugra Gourmet Club in conjunction with Saveur Magazine and because hosting parties and gathering people over food is a joy of mine, I was interested in learning more. Plugra, (European style gourmet butter) has enlisted world class chefs from restaurants across the country to share their secrets around preparing a gourmet meal, from beginning to end. A smart and aligned marketing initiative from my perspective, plus I love their butter. 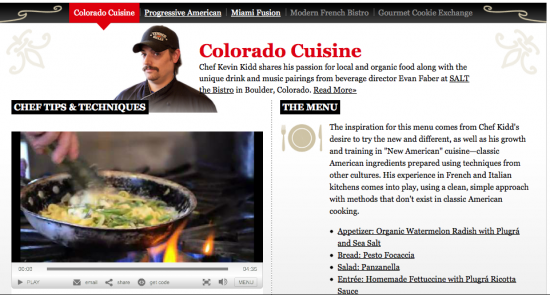 I was also intrigued because their most recent chef profile was Salt Bistro’s Chef, Kevin Kidd. Kevin is a great chef and I love frequenting Salt, right downtown in Boulder. You can see Kevin’s tips and instructions in his Gourmet Club video below. I spoke with Plugra to learn more about the program, the free content they’re providing, one of the more unique Gourmet Clubs they’ve featured and how readers can start their own Gourmet Club. Our interview with them is below. What’s the genesis behind starting Plugra Gourmet Club? The Plugrá® Gourmet Club has been an idea in the works for quite a while. The idea behind book clubs – gathering of close friends who share a common interest was one starting point. The popularity of The Food Network, The Food Channel, food blogs and other websites has made it obvious that consumers want to emulate chefs as much as possible. We have always had a great relationship with the chefs who choose to use Plugrá® European-Style Butter because of its higher butterfat content, excellent flavor and consistent quality. It was a natural fit for us to help connect our Plugra-loving chefs with these food enthusiasts. The chefs offer up everything needed to host a gourmet dinner at home, providing an entire themed experience for the readers. Tell me about the components of each interview such as the menu, ambiance suggestions, etc.? Does it vary for each restaurant or can readers expect the same? We showcase a different restaurant with a different theme every other month. Since March of this year, we’ve introduced a variety of cuisines, including Miami-Fusion, Progressive American and, most recently, Colorado Cuisine with the culinary team at SALT the Bistro in Boulder. Each chef prepares the menu and offers suggestions for ambiance, table décor and drink pairings. An added bonus is the insights you get directly from the chefs. They explain the inspirations behind their menus, tell a bit of the history of the cuisines and share their tips and secrets with the readers to help make their dinner parties successful. These details vary greatly from feature to feature because the cuisines are all very different. Each feature includes demonstration videos from the menu to help the home chef recreate the recipe. What’s one of the more interesting Gourmet Clubs you have featured and why? Each of the Gourmet Club features is very different and has its own personality. I really liked the information that went into the SALT articles. Chef Kidd shared his passion for the local food from Colorado, as well as from the Northeast where he grew up. 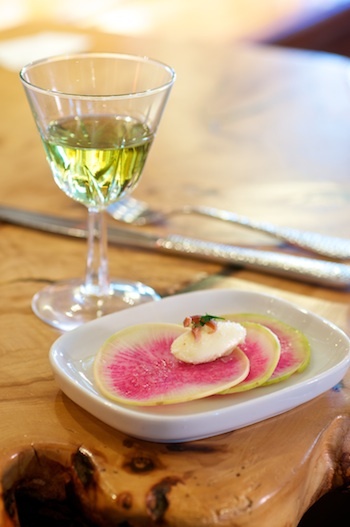 I had never eaten a Watermelon Radish before, but his preparation (see below) with a dollop of butter and sea salt was fantastic. Chai tea is changing the food scene, being incorporated into every course possible, including desserts like the Chai Cake with Swiss Meringue Buttercream. Chefs Colby and Megan Garrelts from Bluestem in Kansas City, Mo., defined the movement to classify American Cuisine by regional tastes and techniques, known as Progressive American. Sampling the menu for the Miami-Fusion menu was a treat for my palate. How can readers start their own Gourmet Dinner Club? Can readers encourage you to feature a specific restaurant or cuisine? It couldn’t be easier for readers to start their own Gourmet Clubs, or turn their existing dinner clubs into Plugrá Gourmet Clubs. All they have to do is register their clubs at www.saveur.com/plugra; there, we have helpful tools like a how-to guide for starting a dinner club and customizable templates for invitations, menus and place cards. The how-to guide includes tips on finding the right group of friends who share your passion for food and how big your group should be. Once registered, they can invite friends to join them. From there, they will receive updates from Plugrá and Saveur with menus, entertaining tips, announcements when a new Gourmet Club feature is online and special offers from Plugrá. Members can also enter their clubs to win a free dinner party. Each month we are selecting a Club of the Month to be featured on Saveur.com, and awarding them with $500 to go toward the club’s next dinner party. Finally, how can people stay involved in the Plugrá Gourmet Club? To stay involved with Plugrá and the Plugrá Gourmet Club, like us on Facebook. We post all kinds of entertaining tips, recipes, culinary insights, videos and photos on our page. From behind-the-scenes photos with the chef to exclusive videos, we explore each menu a bit further with our Facebook family. When we are getting ready to launch a new Gourmet Club feature, we announce it there first. Fans can reach out to us with questions, tips, suggestions and stories there. We love to hear from fellow foodies. Thanks to Ashley Campbell and the team at Plugra for the interview. You can learn more about Plugra’s Gourmet Club here: http://www.saveur.com/plugra/.